Happy Friday lovelies! I'm not going to lie, I had every intention of taking today off from blogging since this week has been crazy busy. Just yesterday I was in meetings for 7 hours, but when I skipped the gym and stopped by Target on the way home and saw the newest collab line I knew I had to blog about it! I've been a huge fan of BaubleBar for years now so when I saw they had a collab line at Target called SugarFix I was super excited about it. So today I'm linking up with Amanda to share some of my favorite pieces from the line! Have you checked out the SugarFix line? If so, what's your favorite piece? I saw that at Target and was super excited! Baublebar is a totally favorite of mine, and who doesn't love target? I am definitely getting the bib necklace! Oh wow! Those are some beautiful pieces!! That bib necklace! This line is the cutest!! I'm headed to target today and can't wait to check it out! Target is the devil, I swear. They just keep adding more and more things for me to buy, but I love these pieces, and you can totally guess where I'll be this weekend! Such a great collab! Baublebar has always been one of my favorite jewelry brands so it's super exciting that it's so accessible in Target now! LOVE all these picks from the line! Just when I thought BaubleBar could not be any better, they join with my other love Target! This is so fun, and I can't wait to get over there and check it out! 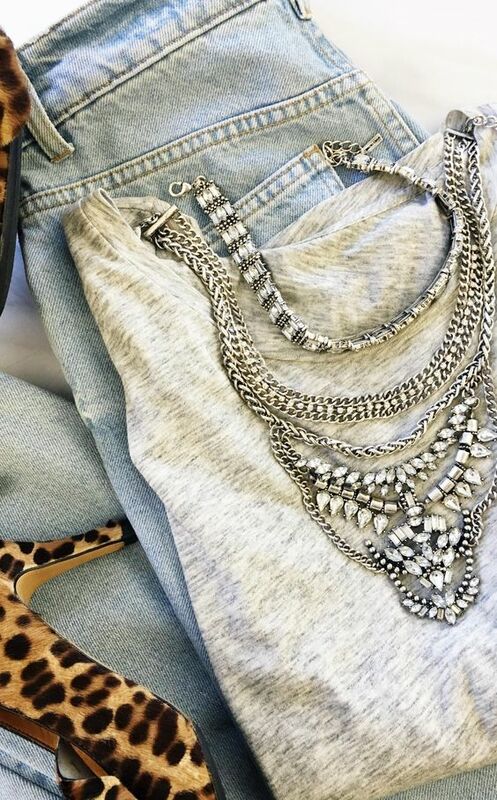 I really like the necklace with the grey sweater! I'll have to look at that one during my next target trip! This collaboration is so exciting! I have loved BB for years too and I'm so excited to check out all the pretty pieces at Target -- those blush earrings are gorgeous! Hope you have a great weekend and can get some rest after a crazy week! That middle right necklace is super cute! I love that they have a line for target! So much good stuff! ok i'm so mad because i was there last night and DID NOT KNOW haha. i take off a couple weeks from blogging and i lose all touch with things. those first earrings need to be in my life and i may just order them online. also i love the choker! all of it. the best. good luck today and see you either tonight or sunday for sure! So funny - I shared about this today, too! I ordered two pairs of earring but will be buying more. I love this collab! Have a wonderful weekend, girl! I am going to Target today to scope it all out, so many cute pieces! Target is SO evil! LOL! I already spend wayyyy to much money in there...it's ridiculous! I can't wait to scope out my Target. Hope you have a relaxing weekend, girl! Oh target, you get me every time! I will have to go check this out! Have a great weekend! I totally bought 2 pair of earrings last night online from the Collab! Can't wait to get them. Enjoy your weekend! That's awesome news Bauble Bar has teamed up with Target. Such cute pieces but way more affordable and convenient to purchase. Enjoy the weekend lovely lady! All of these pieces look so fun! Target really has been doing an awesome job with the collaborations lately! What?! How did I not know about this?! I am going to need to go buy all of these! I've been exercising self-restraint every time I'm in Target because I want to come home with so much of this line - love all the pieces you have here!